The latest T-shirt design that I came up with is of the Misfit Toys from the classic Christmas special Rudolph The Red-Nosed Reindeer. 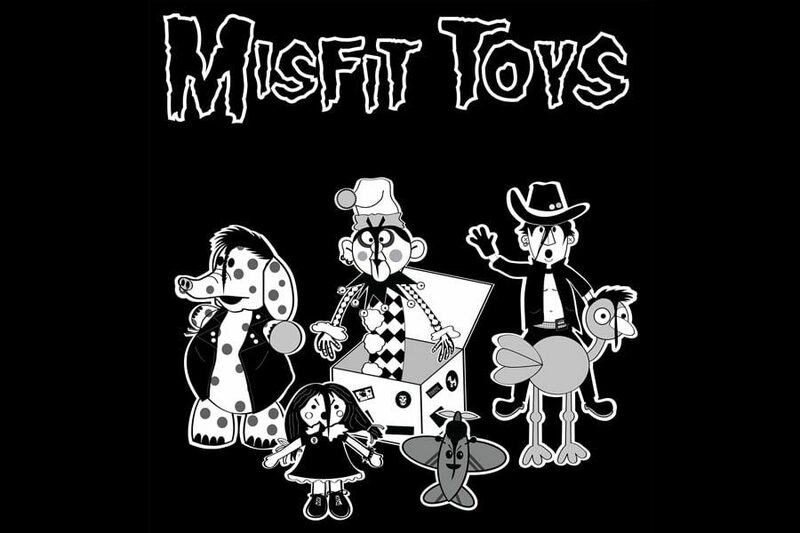 The Misfit Toys are essentially The Misfits, the band. They each got their own devilock hairstyle too. The T-shirt is now on sale for $14 on TeePublic for 3 days so be sure to pick up one if you like the shirt. This would make a great Holiday gift and they are right around the corner! I’ve had this concept in my head for years and even did an old photoshop design of it about 10-12 years ago for READ Magazine. I’ve seen some similar shirts (but not very good) of this going around but if I’m tooting my own horn, my shirt is the best one! After the 3 days is up, the shirt will be 20 bucks plus shipping but I’m sure there will be Black Friday sales on Teepublic. But why not just get it now and spread the word as well. I have 2 other shirts for sale on TeePublic, and I’m sure I’ll have more in the future too. Thanks for the support!